Presidential Candidate of the Liberty and Justice Party (LJP), Lenox Shuman, has formally notified Canada that he is relinquishing his citizenship to that country. 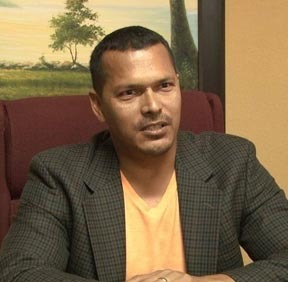 In a statement, Shuman said that he and Executive Member, Sean Dublin, yesterday morning met with Lillian Chatterjee, Canadian High Commissioner to Guyana. “The courtesy call by Mr. Shuman was to formally inform her of his decision to relinquish Canadian citizenship status. Also, he introduced the Liberty & Justice Party as the newly formed political party now operating in Guyana,” the statement said. The party is targeting Amerindian votes, vowing to transform the political landscape of recycled politics that over 50 years of questionable governance has not delivered a viable future for Guyanese. According to the LJP, coming one year before first oil, the upcoming elections will be crucial for Guyana’s future. The issue of dual citizenship was raised after a December 21, 2018, no-confidence motion was carried, heralding fresh elections. Government parliamentarian Charrandass Persaud, a dual citizen, had supported the motion. While that vote is being challenged in the courts, the fact that Persaud had dual citizenship with Canada became a major issue. The court recently said it should not be allowed. Several current parliamentarians reportedly have dual citizenship.